Gary L. Fisher, "Rethinking Our War on Drugs: Candid Talk about Controversial Issues"
The National Drug Control Policy has failed its two major functions (supply reduction and demand reduction) due to faulty assumptions regarding nearly every aspect of the alcohol and drug fields, charges author Fisher. Yet in spite of overwhelming evidence of this failure policy makers have strongly resisted discussing major changes to the assumptions that underly current policy, because of political pressure, bias and philosophical intransigence, he adds. 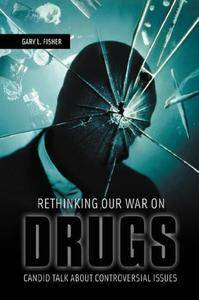 Fisher discusses controversial topics and defends uncommon approaches in chapters focused on subjects including legalization, harm reduction, the futility of supply reduction, the problem of underage drinking and effectiveness of treatment and prevention. He proposes a new national policy for drug control, including elimination of the war metaphor, inclusion of alcohol in the mandate, conceptualization of addiction as a public health problem, utilization of harm reduction principles to guide policy and discontinuation of approaches that isolate drug and alcohol problems from their connection to broader social issues such as poverty. In this work, the premises of the current National Drug Control Strategy are challenged, and both Democratic and Republican administrations across the last 10 years are critically examined. Statements of the Director of the Office of National Drug Control Strategy are critiqued. Major points include that there is no evidence the NDCS has achieved any of its goals, that harm reduction should be its guiding principle, and supply reduction should not be part of the national strategy.